Members of Shincheonji volunteer Mokpo branch are carrying out activities to clean up Mokpo Peace Plaza. Practicing neighbor love including community cleanup activities, mural painting, lunch box of love, etc. About 3,000 members of Shincheonji volunteer Mokpo branch are delivering the light of love in search of dark and alienated places of society with various volunteer activities. The members of Shincheonji volunteer Mokpo branch are becoming a role model to a local community practicing delivering food of love for single elders, being friend, painting mural, etc. in Seo San, Ho Nam, Sang Dong 2-dong, Yong Hae-dong, etc. According to Shincheonji volunteer Mokpo branch, the members spent 5 whole days to prepare Gim Jang (the traditional process of preparation and preservation of kimchi) from scratch such as marinating, rinsing and mixing with other vegetables on 3rd of December last year. Well-made Kimchi was delivered to single elders located in Mokpo province, Mu An-gun, etc. including Yong Hae-dong Kwan Hae senior center, Po-Mi 3rd senior center and Dong Myeong-dong. The senior center is located at Kwan Hae village in Yong Hae Dong. Kwan Hae village not only has a deep history which had a large effect on the name of province but also is marginalized in Yong Hae Dong. So. The members of Shincheonji volunteer Mokpo branch are weekly providing beauty services and housekeeping assistance. Yun Hye Jung (52) who participated in housekeeping assistance on last 13th of December said "It made me think of my grandmother when I was a child. My heart felt warm when I saw them like it." In addition, Kim Hee Kyung (50) are delivering lunch box once a week, visiting Kim Hyung Soo (80) who made his first relation by receiving lunch box of love so called "The Pink Cloth Delivering warmth" and became a beneficiary from 2016. He said "It is not simply delivering a lunch box but we became a friend who shares true feelings with elders. The abundance of heart has come through volunteer activities." In particular, Jang Jong Sun who is the leader of Kwan Hae senior center praised and said "They even painted the wall in the middle of last summer, sweating sweatily"
According to Shincheonji volunteer Mokpo branch, from last 2014, starting with "Wall Painting Stories with hope" which draws stories on old wall, it has been well received by the citizens since underwater landscape was painted on 11 house walls and well-being park tunnel. 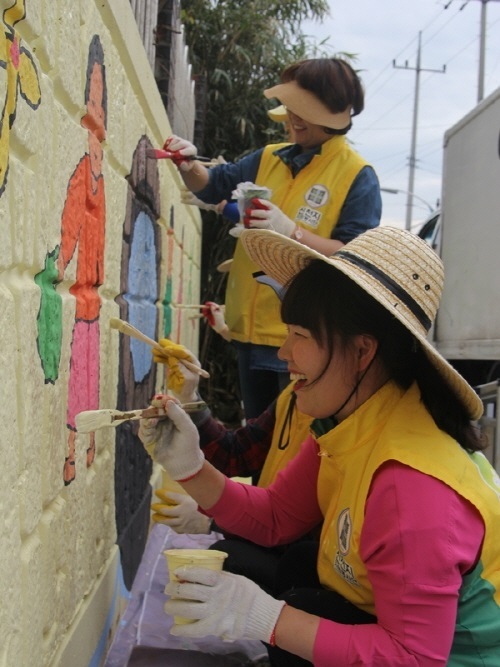 Members of Shincheonji volunteer Mokpo branch are painting murals on Kwan Hae senior center wall in Yong Hae Dong. 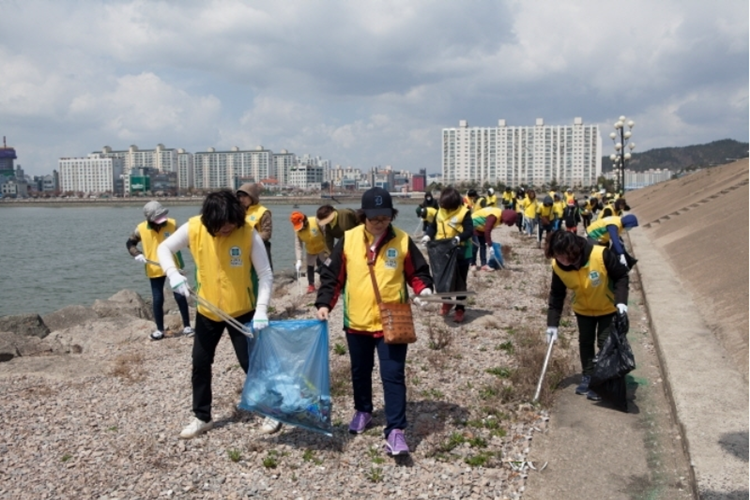 In addition, they are providing not only "Protect the green nature" which is environmental cleanup in order to hand down as a legacy to descendants but also cleaning service once a month in Hah-Dang rose street by 40s to 50s male members and Mokpo station, peace plaza and sunset park by youth members. Oh Jin Ho (59), member of volunteer, said "I felt sorry for cigarette butts scattered all over the street. The cigarette butts scattered all over the street are our abandoned conscience." Snowy streets and bitter wind did not affect the environmental cleanup activities of Shincheonji volunteer. Shincheonji volunteer Mokpo branch not only invites multicultural families and foreign workers who is in medical blind spot and provide medical service once a year but also try to heal the heart in order for them to adapt well to our society. Last March, Lisa (43) in Ham Pyeong who was invited to "Door2(to)Door Healthcare" and received free medical treatment for 2 years said "It was burdensome to go to hospital since my Korean is not good. I felt relieved because I could listen to detail explanation with provided interpreter." Shincheonji volunteer Mokpo branch is carrying out social contribution projects including mural painting service, helping farmers, "The Pink Cloth Delivering warmth" sharing lunch box for marginalized people, "Protect the green nature" a street cleanup campaign and "Door2(to)Door Healthcare" medical service in the social field including veterans, disabled, public interest and culture transcending religious, racial and border. Lee Dong Jin who is branch president of Shincheonji volunteer Mokpo branch said "True volunteer is handing out to anyone like light, rain and air without discrimination. This is the heart of all Shincheonji volunteers in the country."